Beautifully Organised: What to do when your kids say "I'm BORED!" 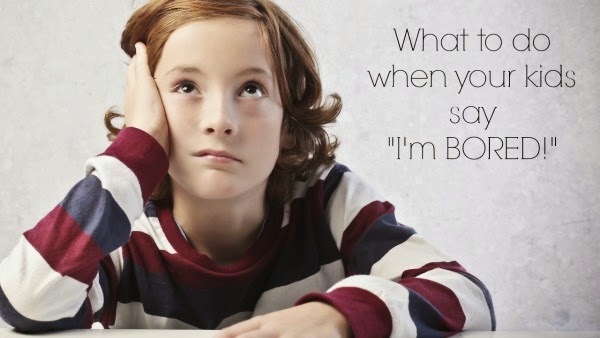 What to do when your kids say "I'm BORED!" It's one of the most dreaded phrases a parent can hear.. "Muuuuuuuum.... I'm Bored!" Ooh it's like hearing fingernails on a blackboard when I hear my kids say that! So today I'm sharing what I do when my kids say "I'm Bored!" in our house! I'd love to hear what you do in your house - how do you react when your kids say the dreaded "Muuuuum.... I'm BORED!" Comment below if you've got a tip to share! Having four kids and many who come to visit - "I'm BORED" was something that came up often one year. So we made a 'BORED JAR'. They wrote a whole heap of activities that they could do if they felt bored, I added in chores for the risk factor (lol) and we also popped in a few treats. It was used for a year on and off - but what i found happened, which also happened with other families that I've introduced it to, was that by doing the process of writing out alternatives, they actually bypassed the bored jar and went straight to the activity! YAY! We had a ceremony to dump the Bored Jar when we moved house - but visiting kids still ask about it!